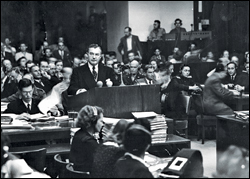 The “today” in Sandra Schulberg and Josh Waletzky’s restoration of Stuart Schulberg’s (Sandra’s father’s) documentary is 1948; but today we are the first Americans to see this wrenching film about the rise and progress of Nazism and the Nuremberg Trials. The film has been shown since last year at various American film festivals and will be seen in the San Francisco Bay Area for a limited time starting January 21st. Stuart Schulberg, with the assistance of his brother Budd (screenwriter of such classics as “On the Waterfront”), made the 80-minute film at the request of the US War Department and John Ford, then working for the OSS (Office of Strategic Services). Its aim was to record the Nuremberg Trials of Nazi war criminals and to show the Germans how their nation had got to where it was after the war. Germans did indeed flock to the film (it would be fascinating to hear their honest reactions), but it was never released in America. The reasons are obscure: was it because, in 1948, the Soviet Union, partner in the trials, was no longer America’s ally? Or because the US didn’t want ugly truths about Germany to interfere with the Marshall Plan? Or simply because the War Department, State Department, and Army didn’t want the American citizenry to dwell on the past? Nobody knows. The film was judged lost, until Sandra Schulberg discovered a German-language copy in her parents’ home and resolved to restore it. Synchronizing the visuals with the trial’s transcripts (narrated by Liev Schreiber), she has achieved this remarkable task. The film’s first segment chronicles the rise of the Nazi party, including the Reichstag fire and German rearmament; and the progress of the war–the Anschluss (annexation) of Austria and occupation of Czechoslovakia, then the conquest of Poland, Belgium, France, etc. Cynically, Hitler declares his friendship with each country before invading it. Russian POW’s are starved and frozen; the Polish intelligentsia, clergy, and nobility are murdered; the Czech village of Lidice is liquidated in reprisal for the assassination of SS Obergruppenführer Reinhard Heydrich. Though much of this footage is familiar to history buffs and people who see a lot of documentaries, it’s nevertheless hard, at times impossible, to watch. The elimination of the Jews forms an important part of the first segment. Again, much of the material is familiar though nonetheless shocking. “We knew the people were dead when the shrieking stopped,” says one Nazi about an improvised gas chamber. What are we today to make of this document? Some of the subtitles and, in fact, the title, show their age (who today would talk about a “lesson for today”? ), and so does the momentous score, created by John Califra from cues by original composer Otto Borgmann (ironically, the composer of scores for Nazi propaganda films). Much of the historical material, as mentioned, is familiar. What seems different – and bracing – is the belief in justice and its swift administration. It’s reassuring to know that many, though by no means all, of the Nazi perpetrators didn’t get away with it. It would be better yet if there were more footage of the courtroom proceedings, but we can take pleasure in the fact that we are among the first Americans to see this material at all.